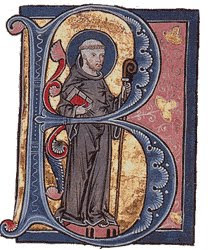 The feast of St. Bernard is of double rite. Today is also the fourth Sunday of August, the fourteenth Sunday after Pentecost and the Sunday within the Octave of the Assumption. The liturgical colour is white. At Vespers yesterday afternoon the antiphons Domine, quinque talenta etc were sung, doubled, with psalms 109, 110, 111, 112 & 116. The Office hymn was Iste Confessor. After the collect of the feast commemorations were sung of Sunday (the antiphon on the Magnificat being Sapientia for the Saturday before the fourth Sunday of August) and of the Octave. At Compline Te lucis was sung with the Doxology Gloria tibi Domine, Qui natus es etc. The Dominical preces were not sung. At Mattins the invitatory is Regem Confessorum Dominum * Venite adoremus and the Office hymn again Iste confessor. In the first nocturn the antiphons Beatus vir etc are sung with psalms 1, 2 & 3. The lessons are from occurring Scripture, the Incipit of the Book of Ecclesiasticus. The first lesson is longer than the form given in the post-Clementine editions. It continues Radix sapientiae ... illius quis intellexit?, what is now the first sentence of the second lesson. The second lesson begins Unus est altissimus.. and continues until defunctionis suae benedicitiur - what is now the middle of the third lesson. The text of the third lesson begins Dilectio Dei... and continues until ...et receptacula a thesauris illius (v.21). In the second nocturn the antiphons Invocantem etc are sung with Pss. 4, 5 & 8. The lessons are proper to the feast. The fourth and fifht lessons are the same as in the later editions. The sixth lesson ends ...inter sanctos relatus est. In the third nocturn the antiphons Domine etc are sung with Pss. 14, 20 & 23. The lessons are a homily of the Venerable Bede on St. Matthew's Gospel. The eighth and ninth lessons are read as one and today the ninth lesson is formed of the three lessons appointed for the homily of the Sunday from St. Augustine on St. Matthew's Gospel. These lessons are longer than those found in the modern Breviary. The seventh lesson (of the Sunday) includes most of the text of the modern eighth lesson, the eighth lesson contains text not found in the later editions and the ninth lesson contains the text of the modern ninth lesson and, in addition, several more sentences. The Te Deum is sung. At Lauds the antiphons Domine, quinque talenta etc are sung, doubled, with Pss. 92, 99, 62-66, Benedicite & 148-149-150. The Office hymn is Jesu corona celsior, sung with the Doxology of the Octave. After the collect of the feast commemorations are sung of the Sunday and of the Octave. At Prime and the Hours the hymns have the proper Doxology as noted above. The antiphons from Lauds are sung at the Hours in the usual order. At Prime the festal psalms are sung (53, 118i & 118ii), the verse in the short response is Qui natus es. Mass is sung after Terce. The second collect is of the Sunday, the third of the Octave. The Credo is sung, the Preface of the BVM and the last Gospel is of the Sunday. At Vespers all is sung as was sung at first Vespers. After the collect of the feast commemorations are sung of the Sunday and of the Octave. At Compline the Dominical preces are omitted.